SOLWEZI: Trinity Congregation – The United Church of Zambia was formed on 16th January, 1965. The Church will, therefore, have been in existence for 50 years in January 2015. In order to commemorate its 50 years of existence, the United Church of Zambia has lined-up countdown Golden Jubilee Celebrations at Congregation (local), Consistory (District), Presbytery (Provincial) and Synod (National) levels. Having launched the celebrations at national level in Lusaka on 19th February 2014, at presbytery level on 2nd March 2014, the countdown celebrations were now celebrated at all United Church of Zambia congregations on 29th June, 2014. At Trinity congregation celebrations were characterised by banner display, members clad in the UCZ chitenge material purchased from Synod. In attendance at the Church service was the Presbytery Bishop Rev David Mujumila.Our reporters Felistus Mbebeta and Sichinsambwe reported that Trinity Congregation of Northwestern Presbytery joined the rest of the United Church of Zambia in a special week long bible study and prayers from 23rd to 28th June 2014 with programmed scripture study materials derived from St John’s Gospel and Galatians 3:28, on the theme “Allone in Jesus Christ”. The bible studies were well attended throughout the week where various sub topics were studied. As the week came to a close on 29th June 2014, the congregants gathered at Church. The Boys Brigade brass band led the procession into the church playing soft gospel music, followed by the Presbytery Bishop Rev David Mujumila and other church leaders. The Church service was led by Mr. Ketson Mpundu, spiced with ululation and specifically composed songs sung by choirs for the occasion. The sermon was delivered by Rev. 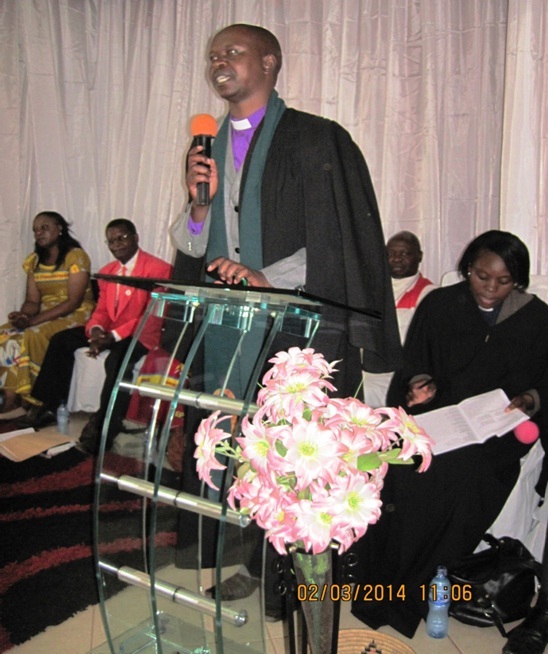 Bishop David Mujumila on the theme “Celebrating Our Unity in Christ”. He reflected on being united in Christ as contained in John 17:1-26 and Galatians 3:19-29, and discussed the need for all members to remember that we are all one in Christ; that each member was important and had a role to play in the body of Christ. He further reminded the congregants that they would achieve more when united than divided and that they needed to tolerate the weaknesses and mistakes of others remembering that their common goal was reaching out to everyone. He called on the congregants to embrace the Golden Jubilee Celebrations of the United Church of Zambia in the spirit of the mission of Jesus Christ, and that of restoration. Both general and local “Histories of the United Church of Zambia” were presented. The worship leader led the congregants in undertaking the “Golden Jubilee Pledge of unity”. The Rev. Bishop Mujumila was later invited to cut and share Golden Jubilee celebration cake as members brought their Golden Jubilee thanksgiving offerings. The church leaders later joined the Bishop in a fellowship meal. Previous: Golden Jubilee Celebrations – Message from GS!